Yesterday, we showed you that you can annotate images on Kotaku. Yesterday, we showed you that you can annotate images on Kotaku. Today, let's go a step further. On this post, you'll see a press release for a video game that came out today. Care to annotate it? If you're reading this on a computer, click on the image above and add commentary. You could make jokes, sure, but you could also raise smart, nuanced points. Your call. 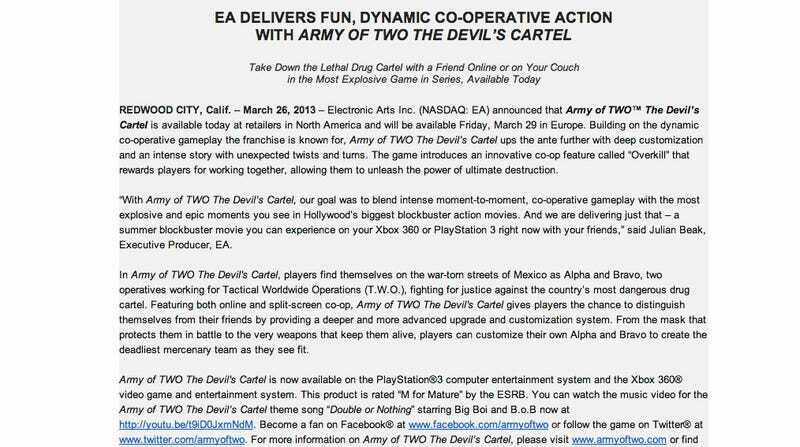 It's ok if you didn't know about the brand-new game mentioned in this press release. A certain other shooter came out today, and I think more people are talking about that one. Poor Army of Two!